Here it is as requested! 5 dinners 1 grocery bag. Prepping ingredients that will be used in more than one meal is a huge time saver! The ingredients in red are used in more than one recipe! Cook pasta according to directions, toss with oil and set aside. In a large pot, add about 4 Tbls. olive oil, add yellow squash and zucchini and sauté until cooked through, then add chicken, artichokes, olives, roasted red pepper, and garlic and rosemary. Next add pasta, balsamic vinegar and more olive oil as necessary. Taste for seasoning. Sprinkle parm on top once plated. Serves 4-6. Put everything into a large pot and cover with cold water, bring to just a boil. Cover and remove from heat and let sit for 20 minutes (if breasts are exceptionally large cook for an additional 5-7 minutes. If you do not have vegetables just use cold water. Sear meat in a pan with about ¼ olive oil until browned, set aside. In a blender or food processor combine vinegar, lime juice, garlic, cumin, oregano and chipotles. Pour the pureed sauce over the meat, place in slow cooker with beef stock and bay leaves. Cook on low 6-8 hours. Remove meat and shred; put back just enough sauce to cover meat. Top with your favorite taco toppings. 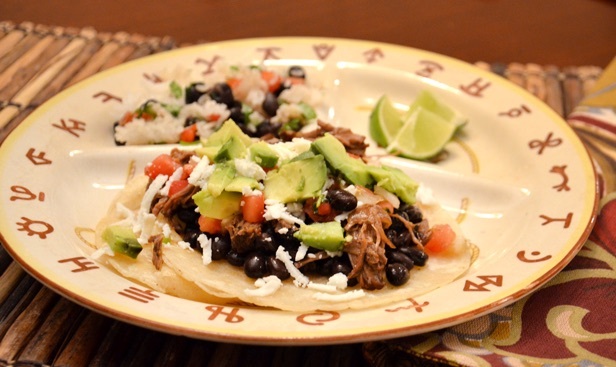 You can serve it in a sautéed corn tortilla or skip the tortilla and serve in a bowl with all the toppings; with white rice, black beans, Chihuahua or jack cheese, salsa, diced avocado, sour cream and a little cilantro. Place white beans in large pot and cover with water (chicken stock); cook until tender about 45 minutes. Drain and set aside. Cook orzo until soft, about 10 minutes. Mix together and set aside. Sauté portabello mushrooms and tomatoes in olive oil until cooked add garlic and rosemary. Season with salt and pepper, Add beans and orzo; add olive oil and balsamic vinegar to coat mixture. Cook until hot. To Serve: Divide bean mixture up onto 4 plates, top with fish. Heat oil in a large pot over medium-high heat add onions, corn and cook until tender; add the garlic at the end. Stir in chili pepper flakes, flour, chili powder, cumin and oregano and let cook a minute. Stir in the milk and let thicken. Add remaining ingredients except cilantro (beans, chicken stock, chicken and chilies); stir to combine; simmer 15 minutes. Before serving stir in chopped cilantro. To serve ladle into bowl and top with shredded jack cheese and top with a dollop of sour cream. Pass the Tabasco for added heat! Add beef and check for salt and pepper, or if you need to add a bit more stock. Serves 8. « Soup is what’s for dinner, this chicken posole verde soup is one of our family’s new favorites!